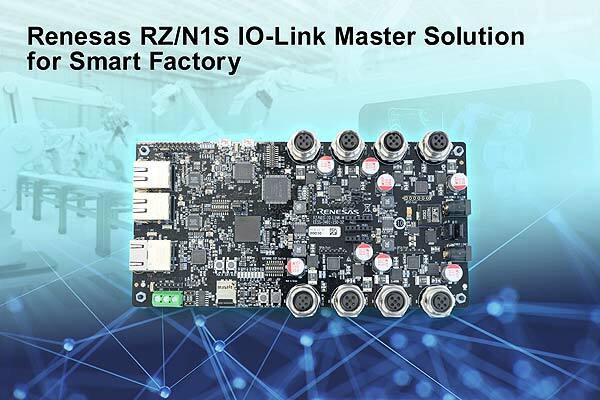 Renesas Electronics Corporation today introduced a new IO-Link master development kit to accelerate IO-Link-based application development for industrial networked devices in a smart factory. The development kit includes a board and pre-qualified sample software provided by TMG. The board has eight IO-Link connecters allowing developers to immediately connect IO-Link slave devices and start the evaluation process. The easy-to-use development kit contributes to shorter prototype-to-production process time and helps to reduce the development burden for engineers. The solution is supported by two CPUs that operate independently and simultaneously with a large built-in SRAM. The eight-port IO-Link Master is controlled by one CPU; the other CPU features an R-IN engine architecture and supports Industrial Ethernet communication to the upper layers, such as PLC, without any external microcontroller, microprocessor, or memory like DDR. Integrating the two CPUs in a small 12mm × 12mm LFBGA package also helps with designing compact PCBs. Small 12mm × 12mm LFBGA package makes the master solution ideally suited for printed circuit boards in space-constrained industrial applications. For more information on the RZ/N1S IO-Link solution, please visit: https://www.renesas.com/us/en/products/software-tools/boards-and-kits/eval-demo/io-link-master-development-kit.html. Availability: The RZ/N1S IO-Link master solution is available now for rental.